To date, 45 people with burn injuries have undergone a procedure in which their own epidermal stem cells are isolated from healthy skin, then sprayed onto the burn to promote healing. In an August 2016 on-line edition of Burns, the journal of the International Society for Burn Injuries, Jörg Gerlach, MD, PhD, director of the Bioreactor Group at the McGowan Institute for Regenerative Medicine and professor of surgery and of bioengineering, and colleagues report astonishing degrees of recovery and full return of burn-injury affected function in all six patients. McGowan Institute affiliated faculty members Alain Corcos, MD, Chief, Division of Multisystem Trauma, Department of Surgery, and Jenny Ziembicki, MD, Medical Director of the Burn Center, both at UPMC Mercy, are co-authors on the study. Partial and deep partial-thickness burn wounds present a difficult diagnosis and prognosis that makes the planning for a conservative treatment versus mesh grafting problematic. A non-invasive treatment strategy avoiding mesh grafting is often chosen by practitioners based on their clinical and empirical evidence. However, a delayed re-epithelialization after conservative treatment may extend the patient’s hospitalization period, increase the risk of infection, and lead to poor functional and aesthetic outcome. Early spray grafting, using non-cultured autologous cells, is under discussion for partial and deep partial-thickness wounds to accelerate the re-epithelialization process, reducing the healing time in the hospital, and minimizing complications. To address planning for future clinical studies on this technology, suitable indications will be interesting. We present case information on severe second-degree injuries after gas, chemical, electrical, gasoline, hot water, and tar scalding burns showing one patient per indication. The treatment results with autologous non-cultured cells, support rapid, uncomplicated re-epithelialization with aesthetically and functionally satisfying outcomes. Hospital stays averaged 7.6±1.6 days. Early autologous cell-spray grafting does not preclude or prevent simultaneous or subsequent traditional mesh autografting when indicated on defined areas of full-thickness injury. 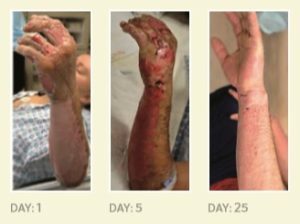 Illustration: Photographs of a patient’s burn injury taken before, five days after, and 25 days after being sprayed with a solution containing stem cells from his own skin. University of Pittsburgh School of Medicine 2017 Annual Report.